'Walts' (The Bridge Cafe) was a green wooden hut on the A634 on the outskirts of Blyth. It was where cyclists headed on training nights and at weekends. Inside there were wooden forms and tables - no tablecloths but good memories are still to be had of the food and drink served up. Drinks were in old type pint pots and the coffee and tea looked exactly the same, if Walt was asked which was tea and which was coffee, he used to smell them to decide! There was also accommodation at Walt's for people to stay there when they were racing in the area. often there would be hundreds of bikes stacked all round, they were piled up against each other outside as there were so many cyclists there. There was never any trouble or vandalism. On Tuesday and Thursday training nights we often cycled from Rotherham via Tickhill and Bawtry to Walts for a mug of tea, then we all had a 'big burn up' (a group of cyclists racing against each other), to see who was the fastest as we headed back home via Maltby. Some vetran cyclists used to ride from Sheffield or Rotherham and just sit in Walt's all day talking. The place was a haven for all types of cylists even families out for a leisurly ride. My first cycle ride was to Walts when I was five or even younger, I was sat on a home made seat on the back of my dads bike. Both Walt and his wife had grey hair, and sometimes they had other people helping in the Cafe as it was always busy. My Dad used to go to Walt's when he was cycling in the late 1920's, early 1930's but it was a different Walt to the one who was there in the 1950's. We sometime took a walk to the humped back stone bridge near Walts's cafe to look at the river, there wasn't a lot of motor traffic in those days but if a car came you had to breath in. Today there are traffic lights on that bridge. Eventually possibly in the early 1960's Walt's changed hands and the new owner built a hotel on the site. However the cycling memories of 'Walts' live on. 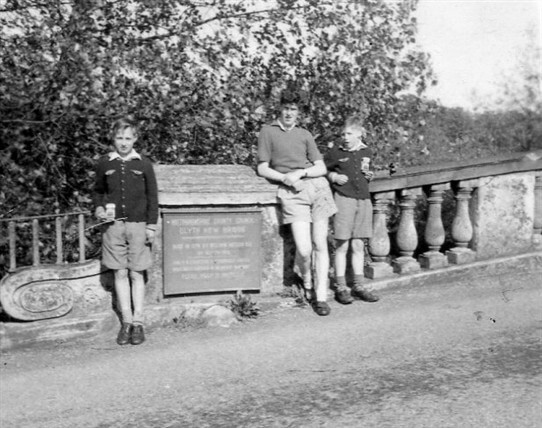 Malcolm Marples with cousins Brian and David Stevens on Blyth New Bridge near Walts Cafe where they had cycled to. This page was added by Pauline Marples on 05/11/2013. What memories!! I was a member of Mansfield Vics in the mid 50s and if there was a 25 mile event on the A1 we would stay at Walts, the upstairs was crammed with beds to the point where when you lay down the sloping roof was inches above your head and you had to roll out of bed. We were going to a Medium Gear event at Thorne in March and the weather was lousy so we called at Walts to stay the night but there was no room for us in the main building but in the garden was an old railway carriage, bearing in mind it had been raining for days he picked up a sodden pegged rug from the ground and said this will make it more comfortable, I have never slept in such a cold place and was walking around Blyth at 5 o clock in the morning, but we all survived to Pension age. 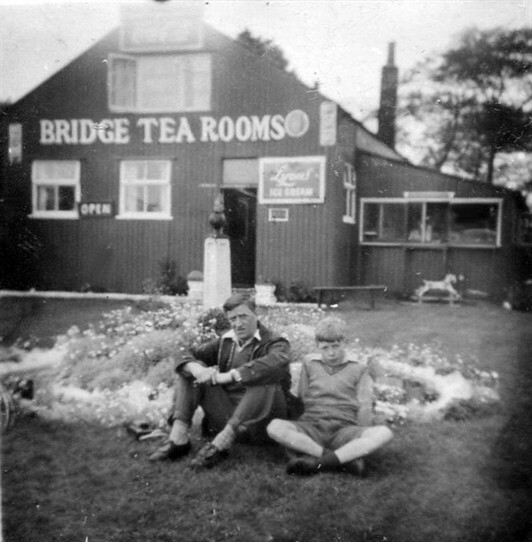 My great granddad Wilfred Fretwell owned the Bridge tearooms at Blyth during the 1930s-40s. My grandma lived there with her brothers and sisters - she is still going strong at the age of 94! They all had chores to do at the café including lots of laundry from the dorm where some cyclists stayed over in the dorm. They all lived in the bungalow next door. Wilf eventually moved to Skegness and opened a guesthouse, the café was taken over by another in the family (I think it was his son - also Wilf and his wife Beaty, but I need to check to make sure). First time I visited Walts, it was the mid-1950s and I was in my pram. My mum looks after me while dad earned his living taking photos of riders in the many time trials which started and finished at Blyth. A year or two later, and I recall complaining to dad that he didn't serve Heinz beans on his toast. Saw many famous riders there over the years, and met quite a few as I handed them my dad's details so that they could order pictures, but by the time I was racing on the O2 (for Sherwood CC), the cafe had long closed. Didn't the 02, 25 mile course start at Barnby Moor at Telegraph Pole no ??????? The other course the 02a turned off at Bawtry to Austerfield etc, I didn't like that course!! A couple of years ago a friend picked up a copy of the RTTC handbook at a boot sale, it was a well organised book and detailed events to enter, and the course start and finish details. I have just fished out a photo of myself on the 02 course and the Photographer was A Thorpe of Bakestone Moor, nr Whitwell, I remember collecting it from his home!! The Clubs I remember in the 50s were Mexboro Wheelers, Thurcroft Welfare,[King bros and sister, Tina, Cis Loundes, Dearne and District Wheelers, Clowne W, Bolsover Castle, Sheffield Pheonix, Newark Castle, Chesterfield Spire,Nottingham Castle, Notts and Derby Clarion, Broad Oak, Sherwood CC, Arnold CC, Ericsons Wheelers, Nottingham Pheonix, Beeston RC, N.Notts Olympic, and that was the semi local clubs!! You can imagine why Walts was full to the brim trying to accomadate all these riders. The 02 course was a fast course and riders hoped to better their personal best times for the 25 mile!! Blyth Tea Rooms were affectionately known as the Ranch House. To stay overnight was quite an experience with the en suite facilities (a central bucket ) in great demand after a few drinks in the local. The outdoor loo was unique too a double seated chemical affair. Still the food was good and Walt made you welcome even during the winter months on Tuesday and Thursday evenings when it was a more social run. It was a bit a of a wrench to leave the warmth and glow of the Tilley lamps to turn out for the run home. Sadly that era has gone forever but I am glad I had the pleasure of it. Colin Wade. Rotherham Wheelers Cycling Club. By Colin Wade. Rotherham Wheelers C.C. Colin!! you mentioned the De Lux Toilets outside, I remember them as a row of about 10 closets with doors but no partition between each toilet, I have dined out on that story for years. This was from 1952 to 1958ish. Also Walt when cooking your breakfast allways wore a flat cap and a handkerchief scarf round his neck. In the mid 60s I decided to show my family Walts, Bridge Cafe, I was flabbergasted, there was a fancy, posh restaurant built in it's place. I'm Walt Hall's granddaughter and I have some very happy memories of busy times at the cafe, outside on the lawn with what seemed like hundreds of cyclists in the sunshine. My grandad loved everybody, he always had a smile, he lived for the cafe and the bikes. The flat cap and hanky story is true. He knew everything about bikes, my brother John and I always had a good one, and we could make a mean trolley to ride down the hill to the car park. Just watched the Beryl Burton story on Countryfile, I remember her coming back with blisters one day. Fun times, nice to read the stories on here.. Carol. I used this cafe a lot in the late 1940's particularly 48/49. I was with the Clarion club in Mexborough. I would sometimes ride out there on a summer's evening. It had a wonderful friendly atmosphere and in summer was packed out, beautiful memories. I'm 80 now and live in New Zealand. Thanks for being there. I was born at Bridge Cafe. My Grandparents Wilfred and Sarah Fretwell owned it. My Mum used to help out there while Dad was a coal miner. Mum tells me stories of the many cyclists "looking" after me. Carolyn who wrote earlier is my niece. I now live in Australia and on one UK visit took Mum on a memory ride and also found the resturant on the site. They had photos of the area and I told them there was one missing, that they should have one of the cafe. Haven't been back there since. Re Tom Shead's question, the course on the old A1 that started near Barnby Moor (I think the start was actually at Torworth, near a chicken farm called Day Old Chicks!) was the 01, not the 02. Blyth was always a hot spot for cyclists from the Doncaster area (like myself), and over the years the various 'tea places' were Walts, the Bungalow Cafe and the White House Cafe. Possibly under the description of long distance migrants. My club (Hull and East Riding RC) used to do an early season get the miles in ride to the ranch in the Early to mid 60s. It was like arriving in a wonderland with so many fellow cyclists and bits for sale. One clubmate bought a frame and transfered all the stuff from his old machine over onto it before putting his old frame up for sale and riding home on the new one. Far removed from the scientific training of today, was the amount of miles done on slices of beans on toast and pint mugs of tea. This must be the Colin Wade that came to Bridlington with the Marshall family back in the late 50s is there any Rotherham Wheelers guys still around from back then? I remember Jim and Mary Donovan and John Milner, Keith Bartlett and I think Pete Kyle was Rotherham wheelers, and of course I remember you very well, I still miss those days on the bike, have still got a nice bike but don't go out too much now since cyclists are getting run over more and more. Hi Malcolm, I guess your time was just before mine do you remember my brother Tony Marshall? he was Rotherham wheelers for a time, yes it would be good to see who is still alive and kicking since over the years we all loose touch, Walts was a great place, spent just about all my time there back in the early 1960s up until Walt sold the place. Enjoyed your photos. Hi to you all,I joined Rotherham Wheelers in 1951,still in contact with Col Wade and Malc Marples by the odd email and phone call, regretably lost Jeff Donovan just two years ago, saw John Milner last year. Yes who could forget the shrine called Walts Cafe at Blyth, most training runs ended up there, and as captain for a time at least one club run a month ended up there for tea. Great memories. Tony, you must remember me from the Mexborough Wheelers? I remember you and where you lived very well. You are right about these guys and Rawmarsh and Parkgate, I had forgotten this since my brother Tony had just about stopped cycling by the time I came along since he went into the forces, I live in Norwich now and have a Daughter that worked at Plumstead hospital for quite a while, I moved down here in 1968 but have still got a bike and get out now and then but there is a lot more traffic on the roads than in our time, I saw a photo of Rotherham in the 1960s a few days ago and there was one car on a road about a quarter of a mile long so its no wonder we didn't get knocked of too often, great to hear from you.